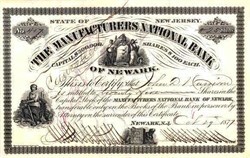 Beautifully engraved certificate from the Manufacturers National Bank issued in 1877. The company was incorporated in New Jersey. 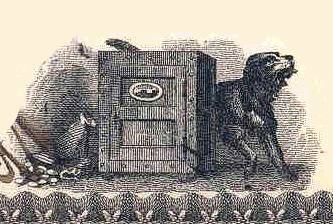 This historic document has an ornate border around it with a vignettes of allegorical women by a shield, a woman in front of a factory and a dog guarding a safe. This item is hand signed by the Company�s President and Cashier and is over 125 years old. Pen cancelled in VF Condition.